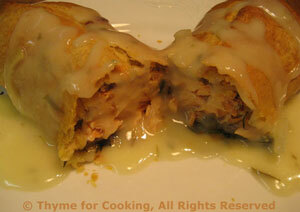 Salmon en Croute, Thyme for Cooking easy gourmet dinner. The puff pastry is a bit easier to work with than phyllo, and makes a more traditional 'En Croute'. The puff pastry is the 'carb' for this meal. Cooking a whole salmon in puff pastry is a classic party dish. This is a scaled down version for individual servings. For a dinner party they can be assembled ahead and baked at the last minute. The salmon stays moist and perfectly flaky. I've given the dimensions used in the photos. If your salmon is a different shape, you need enough pastry to cover it. Trim any excess. 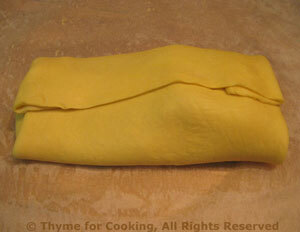 1 large or 2 small sheets of puff pastry If they are not big enough you can roll them out a bit (using a rolling pin). Lightly roll puff pastry dough if needed. It needs to be just large enough to cover the salmon with an overlap of 1/2 - 1 inch (1.25 - 2.5cm). Lightly cover an area roughly the size of the salmon with dill. Skin salmon if needed, and cut/trim. Place salmon on top of dill. 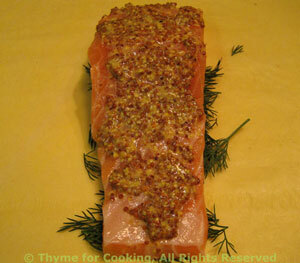 Spread 2 tsp mustard on the salmon. Depending on the shape of your fish you can bring opposite corners together (if it's square-ish) or fold over (if it's long-ish). Press the meeting edges of the puff pastry together to seal. It's okay if there are gaps in the 'package' as long as the pastry is sealed together enough to hold it's shape as it bakes. Bake at 400F (200C) for 15 - 25 minutes, until the pastry is golden brown. Add tarragon, wine and stock and bring to a boil. Simmer 5 minutes. 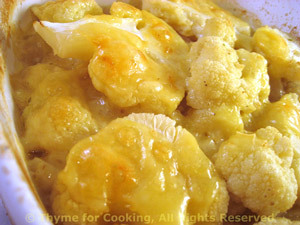 Mix cornstarch in 2 tbs stock and stir into simmering stock. Cook until thickened - should be quite thick.